Of all the James Bond films, perhaps one of the most complex pre-production tales comes from "The Spy Who Loved Me". Following from the box-office disappointment of "The Man With The Golden Gun", Albert R. Broccoli (now operating without co-producer Harry Saltzman after he sold his share of Eon Productions) made a conscious decision to bring Bond back to his biggest, and best. But the road to success would prove to be one of the most winding of all the Bond productions as the building block for the film - the screenplay - went through more iterations than any production during the 40 year history of 007 on the silver screen. It all started with the title. As "The Spy Who Loved Me" novel was a departure from the usual Ian Fleming canon, and told from the perspective of a young woman with Bond only appearing the the final quarter of the story, Fleming never wanted his controversial book to appear on screen. But as most of the Fleming titles had been exhausted by the movie franchise at this point, Broccoli requested the Fleming estate give him permission to use the novel's title only - which they granted. Broccoli now had a title for his next movie, but no story. Following a visit to Russia, Broccoli devised a plot befitting the title whereby a female Russian spy would fall in love with James Bond. The seeds were set for Bond's tenth film. 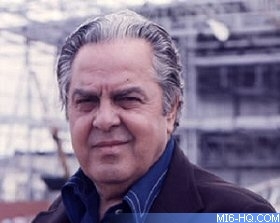 Above: Cubby Broccoli went through a dozen writers until he got the film he wanted. "You Only Live Twice" screenplay writer Roald Dahl recommended comic writer Cary Bates to Broccoli, and this would be only the first of several parallels between the two films. The New Yorker created the first screenplay based on a loose adaptation of Fleming's "Moonraker", which saw SPECTRE using a large underground base in Loch Ness, Scotland. The villain's plot mechanism of hijacking nuclear submarines would see it through the following ten writers to the final film, although in Bates' treatment Bond and Tatiana Romanova teamed up to foil Hugo Drax and his henchmen Pluto and Plato (a chain smoker and alcoholic respectively). Above: Nuclear submarines featured throughout the rewrites. Broccoli was not happy with the screenplay and brought in novelist Ronald Hardy to start from scratch. His plot also involved nuclear submarines, but this time the villain was equipped with tracking technology for capturing the subs. This idea would be carried on throughout the project despite Broccoli moving to the third writer. Anthony Barwick picked up from where Hardy left off and recycled the submarine tracking device idea, but axed SPECTRE and brought in a villain obsessed with art. Zodiak's plan was to ransom the world to give up its art treasures with the threat of destroying the West's nuclear fleet using long range torpedoes. Barwick's most original contribution was the introduction of the villain's henchmen, which in his treatment were albino triplets Tic, Tac and Toe - all three of which would be killed by 007. Broccoli then brought in Derek Marlowe, Sterling Silliphant, Tom Mankiewicz, John Landis and Anthony Burgess in turn after Barwick departed the production. At this point a director was assigned to the floundering film. Guy Hamilton was not a surprise choice, having directed the previous three films ("Diamonds Are Forever", "Live And Let Die", "The Man With The Golden Gun") and brought with him Bond family member Richard Maibaum to work on the script. Maibaum brought back the shadow of SPECTRE but scrapped the idea of a megalomaniac villain in the shape of Blofeld or Zodiac. In one of the most interesting ideas devised for the Bond series, but as yet unused, SPECTRE would be overthrown by a collection of terrorist groups. Leaders of the Japanese Red Army, Black September Organization, Bader-Meinhof Gang and Red Brigade would storm into a SPECTRE meeting and assassinate the old guard, taking over control of the world's largest criminal set-up. The plot saw the new SPECTRE throwing out revenge and extortion as ideals, preferring to settle for annihilation by destroying the world's oil supply with captured nuclear submarines. Broccoli liked Maibaum's treatment, but considered it too controversial for 1976 and would later order changes. Considering the state of the world today, Maibaum's idea is scarily plausible, and if too controversial back then it is unlikely to see the light of day in the 21st century. Richard Maibaum explained, "They level the place, kick Blofeld out, and take over... They're a bunch of young idealists. In the end, Bond comes in and asks 'All right, you're going to blow up the world. What do you want?' They reply, 'We don't want anything. We just want to start over - the world is lousy. We want to wipe it away and begin again. So there's no way we can be bribed!'" "I never had Stromberg - or whomever the hell it was in that movie - or that interminable thing that went on in the tanker" - Richard Maibaum said in an interview in STARLOG, March 1983. 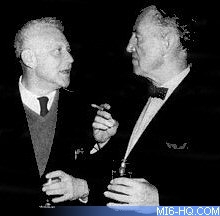 Above: Richard Maibaum and Ian Fleming in conversation. 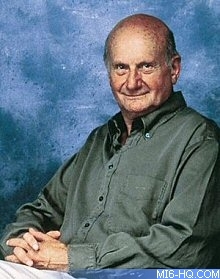 Guy Hamilton quit the production in favour of the new "Superman" franchise, although he was replaced on that project by Richard Donner, and failed to see either film through to completion. Lewis Gilbert was signed to take over the helm of "The Spy Who Loved Me", and brought with him writer Christopher Wood to pick up from Maibaum's draft. "I had written ‘Seven Nights in Japan’ for Lewis Gilbert. We got on well", Christopher Wood told MI6. "I was rung up by him and asked if I wanted to write a Bond movie. I thought he was joking!" Under the order of Broccoli's instructions, the terrorist group were removed from the story, and the megalomaniac villain was back in the form of Stavros, a wealthy shipping magnate. Stavros would use huge tankers designed with a special bow to kidnap nuclear submarines - similar to how Blofeld captured space capsules in Gilbert's "You Only Live Twice". The idea of using a supertanker as the device of villainy was not new either, as Maibaum's early treatments for "Diamonds Are Forever" saw Goldfinger's twin brother (to be played by Gert Frobe), and later Blofeld, firing a huge laser weapon from the deck of the ship. 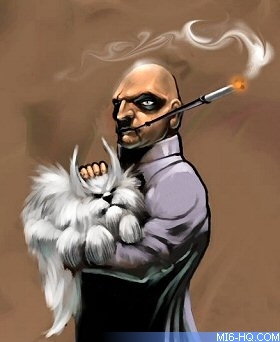 Left: Blofeld, or a character in his style ,was the villain in most treatments up until the Kevin McClory legal action. (Art by Nicholas Anderson). 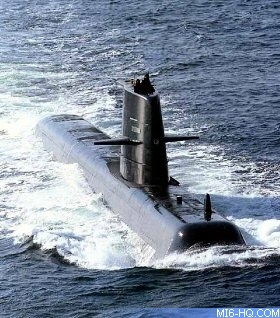 For the final draft screenplay by Wood, the nuclear submarine tracking device was to be used by SPECTRE to capture British and Russian submarines with Bond and Anya Amasova teaming up in Cairo after being played off against each other by the third party - a typical SPECTRE plot line similar to "From Russia With Love". Bond and Amasova would them travel to Sardinia to face off with Stavros in his underwater base. The villain's henchman became Jaws, whose steel capped teeth were inspired by the goon from Fleming's novel - despite Broccoli's agreement not to use anything except the book's title. Wood explained to MI6, "The script I received was vastly different and featured - if I recall correctly - a dastardly band of young radicals and a gloomy Norwegian fjord. I suggested a return to more 007 audience-friendly territory." Just when everything was going smoothly, in stepped Kevin McClory who claimed Eon Productions had no rights to use the SPECTRE organisation which the courts had awarded to him during the 1963 "Thunderball" legal settlement. Faced with the possibility of another long drawn out battle in the courts, Broccoli asked Wood to remove all references to SPECTRE from the screenplay - even changing the colour of the villain's private army from black to red - to avoid any claims from McClory. Without SPECTRE, Stavros evolved into shipping billionaire Karl Stromberg, who would threaten to destroy humanity alone. Despite all the changes, McClory was still not happy with Broccoli's production, but eventually dropped an injunction on the film's production, probably due to realisation of the potential legal costs involved with stopping the Bond juggernaut. Another old alliance would haunt the production of "The Spy Who Loved Me". Back in 1970, "Thunderbirds" creator Gerry Anderson was asked to provide a treatment for the next film which was planned to be "Moonraker". Anderson teamed up with his script editor on his popular TV series "UFO" - Anthony Barwick. The partnership created a seventy page draft which featured a supertanker, a villain named Zodiak and identical triplets Tic, Tac and Toe. The treatment was turned down and Eon Productions decided to move ahead with Sean Connery in "Diamonds Are Forever" instead. Unsurprisingly, Anderson recognised the similarity of this treatment with the one Broccoli received from Barwick in the mid-1970's for "The Spy Who Loved Me", and brought legal action against Eon Productions. Gerry Anderson explained in his authorised biography, "My lawyers weren't show business lawyers, so I was really in a very weak position. I must confess I became very frightened, and after a few weeks decided to drop the matter." Anderson was persuaded that a court case would not be in the interests of anyone, and he dropped his claim in return for selling the treatment rights to the production for £3,000. The final shooting script was nailed down on 23rd August 1976, but several further changes would be made by Christopher Wood and the production team during the filming. Less than a year later on 13th July 1977, "The Spy Who Loved Me" opened with a Royal Premiere at the Odeon Leicester Square in London and concluded one of the most turbulent and creative Bond productions in the 40 year history of 007's movie exploits.